We have an extensive fleet of RTK GPS hire, Differential sub-metre GPS hire, and survey grade GIS rental packages. 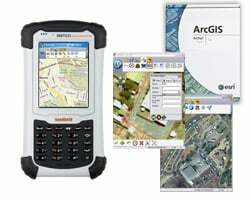 These packages come all set up, tested, and backed with free support from the Johnny Appleseed GPS - GIS support team. Generally, units are available for pick-up only in Brisbane. Any freight charges to you, and return, are always additional, or at your own cost. For more information, or to arrange a hire, call us on 1800 477 477 or 07 3717 8555. Our OmniSTAR HP or Hemisphere Atlas H10 decimetre hire packages includes everything you need to achieve real time horizontal accuracies of 10-15cm anywhere in Australia. No messy or error-prone post-processing back in the office. Our hire fleet uses the latest generation Hemisphere survey-grade GPS, and is supplied with ESRI ArcPad data capture software, running on a rugged PDA. Johnny Appleseed GPS sets up the equipment and tests it before hiring it out, to make sure it’s setup the way you need it to be. Of course it is also backed up by our local GIS support team. Our OmniSTAR VBS or Hemisphere Atlas H100 sub-metre hire package includes everything you need to achieve real time horizontal accuracies of 50-70cm anywhere in Australia. No messy or error-prone post-processing back in the office. Our hire fleet uses the latest generation Hemisphere survey-grade GPS, and is supplied with ESRI ArcPad data capture software, running on a rugged PDA. Johnny Appleseed GPS sets up the equipment and tests it before hiring it out, to make sure it's setup the way you need it to be. Of course it is also backed up by our local GIS support team. 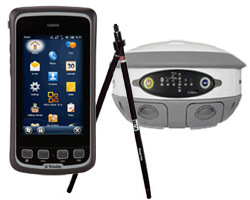 For when you only need 10m GPS accuracy without the bulk, we can supply a rugged PDA for hire. 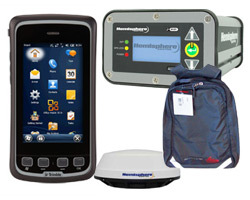 We also have rugged PDAs with built-in 3G modems that we can supply if you need this feature. All rugged PDAs are fully waterproof, have excellent sunlight-readable screens, and all-day battery life.